[3/3/2015:Information] Now we are developing PvP online multiply system. Please wait for it! A 3D real-time strategy game (RTS) with simple controls! 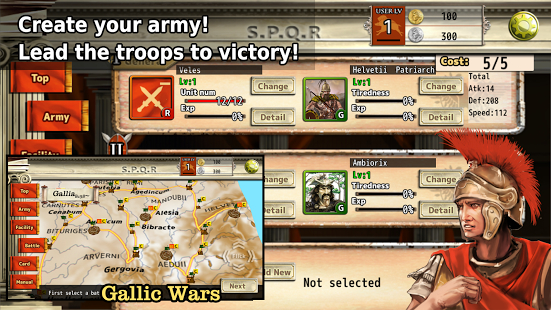 Create the most powerful army and emerge victorious! Over 100 different friendly and enemy units launch a fearsome battle onscreen. Several dozen unique units (swordsman, spearman, etc), along with actual military commanders from history! Deploy a range of skills to seal your victory. Also includes a card game and RPG elements! Collect rare cards to train and power up your units. *Note: For the initial release, the game balance may be subject to change as we tweak it. An item(G-Coin+100) has been added.